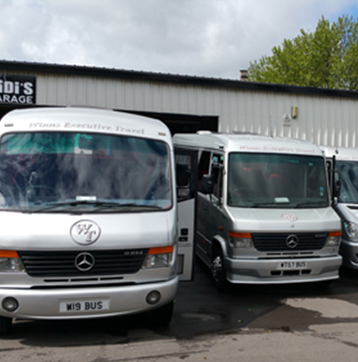 Winns Travel are renowned for executive style minibuses and coaches and have now been operating in the industry for over 12 years. We are still a small private company offering that personal touch which we regard as being very important in the executive market. We believe we can offer the very best in small executive vehicles with the capability to carry up to 33 passengers in style. The minibuses we operate have full on-board entertainment systems. We work for a large number of corporate clients in Sheffield and the Yorkshire region and have established a reputation for our VIP service for high profile visitors and events in the region. The company was hired for filming work for a Hollywood movie in Derbyshire over a 2 month period. We also provide a full wedding service including hen/stag night transport, Mercedes bridal and groom cars, minibuses to take family and friends to the church and evening party and transport to the airport for the honeymoon. If you're based in the Sheffield area and need a depenable minibus or executive coach hire service, Winns Travel is just the ticket! Thanks to professional service and affordable rates offered, our private hire services come highly recommended. © 2019 Winns Travel All rights reserved.